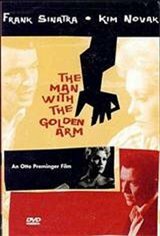 When Otto Preminger was willing to release his drug-addiction drama Man With the Golden Arm without the sanction of a Production Code seal, it proved to be yet another nail in the coffin of that censorial dinosaur. Based on the novel by Nelson Algren, the film stars Frank Sinatra as Frankie Machine, expert card dealer (hence the title). Recently released from prison, Frankie is determined to set his life in order -- and that means divesting himself of his drug habit. He dreams of becoming a jazz drummer, but his greedy wife Eleanor Parker wants him to continue his lucrative gambling activities. Since Parker is confined to a wheelchair as a result of a car accident caused by Frankie, he's in no position to refuse. Only the audience knows that Parker is not crippled, but is faking her invalid status to keep Frankie under her thumb. Gambling boss Robert Strauss wants Frankie to deal at a high-stakes poker game; terrified that he's lost his touch, Frankie asks dope pusher Darren McGavin to supply him with narcotics. When McGavin discovers that Parker is not an invalid, she kills him, and Frankie (who is elsewhere at the time) is accused of the murder. He is willing to go to the cops, but he doesn't want to show up with drugs in his system. So with the help of sympathetic B-girl Kim Novak, Sinatra locks himself up and goes cold turkey-a still-harrowing sequence, despite the glut of doper films that followed in the wake of this picture. After Parker herself is killed in a suicidal fall, the path is cleared for Frankie to pursue a clean new life with Novak.